PYRAMIDS ON MARS is the brainchild of Kevin Estrella. I immediately forgot this was a one-man project as soon as I started listening to new album Echo Cosmic (out now). I did some quick research to learn more. “Influences: JOE SATRIANI, RUSH, IRON MAIDEN, PINK FLOYD…” Yep. They’re absolutely right. Track one, “Dream Division” is one of my favorites. You can certainly pick out the RUSH influences in various parts of the song. Packed with tasty guitar solos, and soaring melodies, this is a decent introduction for sure. “Battle for Rome” was up next and the RUSH influence was even more apparent on this one. Particularly because of the synth work I imagine. Of course, they’re just influences. PYRAMIDS ON MARS has a sound all its own. Derived of many styles, but still very unique. I’m pretty sure I picked up some SATRIANI vibes from this song too. “Death Valley” was the next cut. Driving guitar melodies greet you before sending you soaring through the air with crystal clear guitar solos all the while the drum line ushers you along. Of course, the song wouldn’t be complete without some crazy fast, precise guitar solos, of the SATRIANI and STEVE VAI variety. “Tribute” gives you a bit of a break from the driving songs that came before it. Starting with a relaxed pace, easy melody and crisp tones, you could easily put this one on repeat and let it play through two or three times. Of course, as I’ve come to realize, a PYRAMIDS song isn’t complete without some shredding. It’s only three minutes long, and with such a nice groove, it could have been easily twice that length. “Heaven’s Gate” is probably my favorite cut on this album. I’m a sucker for interesting chord progressions and this one has ‘em. This particular song would… Ahem, WILL be a great roadtrip track. The progressive, driving vibe just urges you on. Kevin has a great feel, letting the chords grow and soar. Even the solo in this song has a great melodic path. One other thing I dig about this is the transitions between melodic ideas. He just moves between them incredibly well. “Sailing the Oceans of Neptune” has a deceptive title. Unless the oceans just happens to be really wild and rockin’. This one has a huge, grungy rollicking groove, inlaid with convincing demonstrations of scale efficiency. I’d love a chance to see Kevin play this live, just to see how fast his fingers are moving. 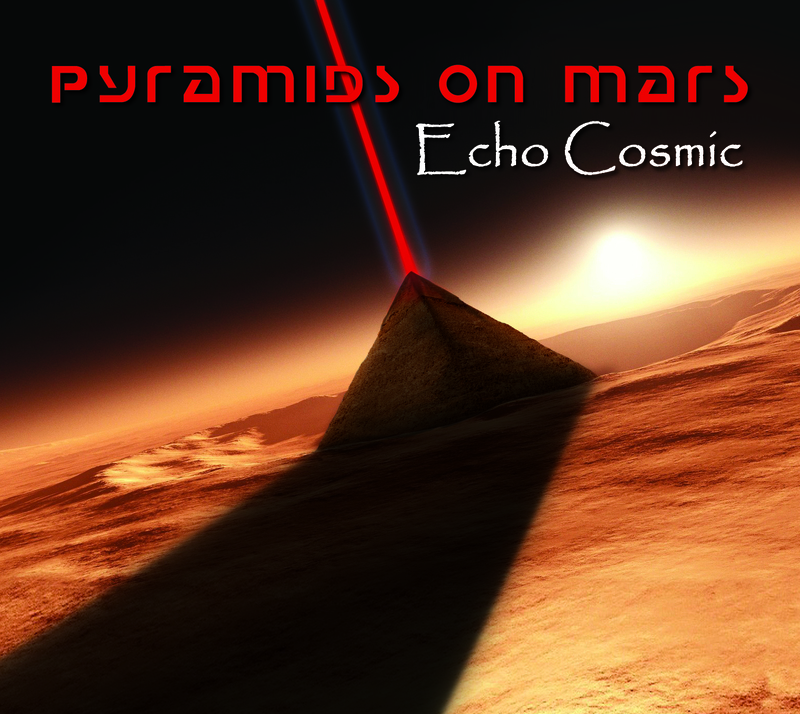 “Spectre of Orion” slows it down a bit yet stays true to the PYRAMIDS sound. There’s a lot going on in this song. With all the synth work, he really puts you in what feels/sounds like a space adventure. After a 2:15 intro, “Order of the Freemasons” catapults you into the air with a huge soaring melody. Then around four minutes in it launches straight into a gnarly heavy metal groove. Complete with blazing guitar solos. “Occam’s Razor” sounds just a heavy as the title would lead you to believe. With the classic bass/guitar power chord sync and heavy hitting drum beat, you’re just beaten into submission and then thrown right into a rather hypnotic synth melody inlaid with soaring guitar riffs. Echo Cosmic ends with the album’s namesake. This one is the best example of the PINK FLOYD influence. You thought the last song was hypnotic! You ever stare into Windows Media Player’s trippy graphics whilst listening to some tunes? I can’t think of a better song for such an activity than this one! It’s really a great farewell from this hard-hitting album. it reminds me of the end of a night out partying with friends. Say 5 or 6 a.m., and it’s just about time to either pass out, or float home. And before you know it, the song comes to a close. You of course, replay this last song at least once more, as you relax and ponder your existence. PYRAMIDS ON MARS, and Kevin Estrella have enough different sounds and feels to keep this entirely instrumental album interesting till the end…impressively so, being such a long album.